Sam Alexander is shocked to find himself facing Doc Green at the Baxter Building. He responded by hitting him with an energy blast! The blast only singes the doctor's lab coat. Doc recognizes Nova and apologizes for his behavior while he was evil during the Axis event. He offers to take a look at Nova's helmet and repair it if possible. Sam is understandly cautious since the gamma powered Hulk had tried to kill him once before. He also doesn't want to risk his secret identity. Doc Green understands and gives him a paper bag to hide in while he inspects the helmet. The powerful physician concludes that Nova's helmet has a heavily damaged component. It is causing the helmet to not always recognize when Sam is wearing it thus causing the power failures. Unfortunately, since the helmet was constructed with a number of heavy alien metals, it can't be fixed on Earth. Sam suggests they go to the Nova Bunker to find replacement parts. Green wishes him luck and declines to go with him. He explains that bad things happen to him in space. However, he offers to loan him one of Reed Richards's spaceships for the journey. The paper-bagged teen blurts out that he can't operate a spaceship and begs Doc Green for help. Doc eventually gives in with the feeling that he'll regret it. Sam decides to take off the bag since he and the former Hulk are both Avengers. Green pretends to be shocked that he didn't know Sam was Nova. Sam Alexander doesn't get the joke until Doc explains that he's never seen him before. Later and light years from Earth, their ship arrives at the Nova Bunker. As they approach orbit, the helmet begins broadcasting an emergency transmission it has received. However, due to its damage, the helmet cannot give the complete message. Sam believes it is a transmission from his father. Doc Green suggests that when the helmet is repaired, the message should come in clearly. At the bunker, the doctor formerly known as the Hulk, rips open the facility's metal door. After looking at the spare damaged helmets, Doc realizes that the needed parts are not there. In desperation, Sam puts on his helmet and instructs it to show him the location of any fallen Black Nova. A holographic star chart appears along with a lighted locator signal pinpointing their destination. The helmet malfunctions again but it was active long enough for Doc Green to memorize the coordinates. Nova grabs the spare helmets and they take off in their spaceship. The planet appears to have been ravaged some time in the past with a chunk of its surface missing. Doc Green reveals he knew of Xandar's existence after his fight with Nova. He had researched the idea that the Nova Force could be used as a source of green energy on Earth. He stopped once he realized the Black Nova helmet was made of too many alien metals. They walk into a damaged structure only to find a family of aliens inside with one of them pointing an energy weapon at Green. The man with the gun identifies himself as Zarihs Didisiqui. Doc Green steps up to Zarihs and states that they are looking for a certain Nova Corps artifact and will be on their way. When Sam shows them the Black Nova helmet, the alien family is suddenly very afraid. The leader explains that Nova must hide the helmet or it will be taken. When Sam asks by whom, the leader's wife tells her husband not to speak the name. Zarihs suggests that the helmet could buy their freedom from Gron. Sam Alexander offers them a deal. If they take Doc and him to Gron, they can have their spaceship in return. The former Hulk objects and questions how he will get home. Zarihs Didisiqui agrees to the deal. Elsewhere in a mine, Gron is whipping his slaves to work harder. Around his neck is a Black Nova helmet on a chain. As he prepares to whip them again, an energy blast flies in and disintegrates it! The slave master turns to find himself facing Doc Green and Nova! Gron is stunned to find a living Black Nova standing in front of him. Nova politely asks him to give them the helmet he's wearing. The alien slave master demands the same thing from Sam. Doc Green walks up to the alien and asks him if he is a Dakkamite who gets his abilities from metabolizing starlight. 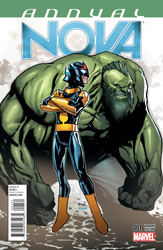 Gron confirms the former Hulk's theory only to find the Black Nova helmet snapped off its chain by Green. Doc Green finishes their conversation by punching Gron into orbit! The green scientist looks at the helmet and is happy to find that its capacitor is undamaged. He also explains that he doesn't want to give away his spaceship especially since they don't know if he can fix the helmet yet. Sam stammers that he's positive it can be fixed. Doc Green realizes without looking that the aliens have already taken the ship. Over the next few hours, Doc works on repairing the helmet. He finally wakes up Sam to announce that it's been fixed! Nova puts on the helmet and instantly flies into space laughing with joy! After testing his abilites, Sam flies back to Doc Green who's been watching him and smiling. Doc says that even though he's wreckless, it was fun to watch Nova fly since he's not been able to fly himself. Sam Alexander asks his green friend how long he can hold his breath. Before he can answer, Doc finds himself being carried through space at warp speed! They arrive at Knowhere and are greeted by Cosmo. 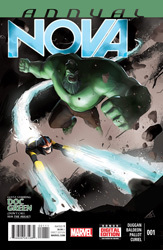 The one-time Hulk tells Nova that it was a magnificent experience to fly through space! He notes that he's fought the Red Hulk and the Thing, been dropped into lava and blown up but none of it compares to that space flight. Nova asks Cosmo to use the facility's teleporter to send Doc Green home. As he's teleporting, Doc asks Sam where on Earth he's being sent. The teen jokingly tells him that it's somewhere nice and warm. On Earth, Doc Green finds himself falling into a volcano! Sam thanks his canine friend and flies back into space. He takes the time to finally listen to the message which was sent to his helmet. The broadcast is not from Jesse Alexander but is coming from someone Nova doesn't know. She informs him that Star-Lord and the Guardians of the Galaxy need help with the Black Vortex. Sam Alexander follows the signal and finds himself face-to-face with the Guardians, the X-Men and Captain Marvel and they're all standing in front of a powerful cosmic artifact!